When I double-click on a large file to open it, the Voxler splash screen stay open for a long time. Can I turn the splash screen off? The Voxler splash screen remains open when a larger project file is opening. 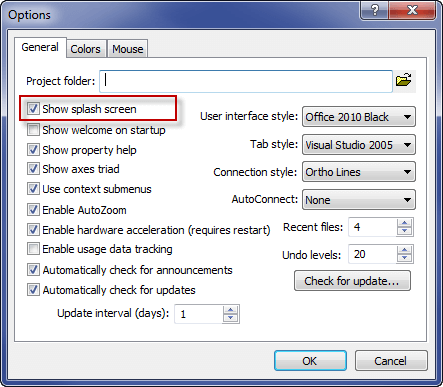 To avoid this, the splash screen can be turned from the Tools menu by clicking the Tools | Options command. In the Options dialog, uncheck Show splash screen to turn the screen off when opening Voxler.